Was America’s first billionaire, John D. Rockefeller, a greedy robber baron, a generous philanthropist, or both? And did the oil tycoon exploit America’s poor or give them access to much-needed energy? Historian and Hillsdale College professor Burt Folsom, author of “The Myth of the Robber Barons,” reveals the truth about the Rockefeller empire. 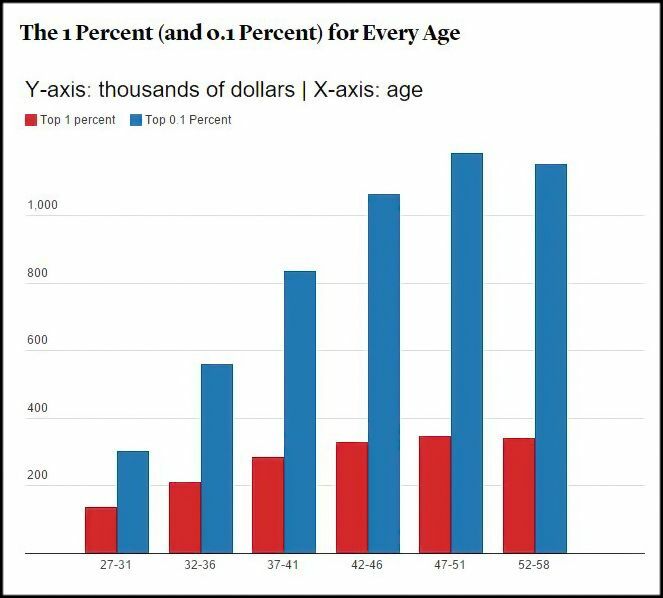 A number to keep in your mind as you read is about how much you have to earn to be in the top 1% ~ and is why “being rich” is a fluid matter and why so many move in and out of this designation of “rich.” There is opportunity for all in this market-based system. And the rich-get-poorer while the poor-get-richer! One should note as well that this number changes by geography as well. The richest percentile of Americans makes many hundreds of thousands of dollars a year. So how could a $135,000 salary make you a one-percenter? If you’re 31 or younger, that figure puts you ahead of 99 percent of your age group. This chart partially explains why the 1 percent is such a fluid club (about half of the top 1 percent flips over every year.) To stay in the top percentile, a 30-year-old earning $130,000 in 2010 would have to raise her salary by $80,000 by 35, and then another $70,000 before she turned 45. The Kochs’ critics are free to disagree with the Kansas industrialists and their libertarian ideas. However, most who despise the Kochs would be shocked by what these “greedy capitalists” do with their profits, beyond campaign donations. For starters, the Kochs, support university programs and think tanks that try “to understand the nature of human freedom and how that freedom leads to prosperity,” as the Charles Koch Foundation (CKF) explains. $25 million to Houston’s M.D. Anderson Cancer Center to eliminate genitourinary malignancies. $100 million for cancer research at the Massachusetts Institute of Technology. $100 million for a new ambulatory care center at New York Presbyterian Hospital. This donation actually triggered an outbreak of mental illness among leftists who decried Koch’s nine-digit check. “Quality care, not Koch care!” unionized nurses screamed outside Koch’s Park Avenue apartment. Never mind that his contributions create work for unionized nurses. The Kochs back the arts. Elizabeth B. Koch, Charles’ wife, launched the Koch Cultural Trust. It has furnished $1.8 million in grants to artists and musicians with ties to Kansas. David Koch supports PBS’ documentary series “Nova.” He also is a paleo-philanthropist, having given $15 million to the Smithsonian Museum of Natural History for a Hall of Human Origins and another $35 million to update its fossil and dinosaur displays in Washington, D.C. New York’s American Museum of Natural History will enjoy a new Dinosaur Wing, thanks to David’s $20 million gift. David also donated $100 million in 2008 to modernize the former New York State Theater at Manhattan’s Lincoln Center, home to the New York City Ballet and the New York City Opera. The Kochs also steward the environment. “Koch Industries, Inc. takes a leadership role in the promotion of biodiversity, wildlife habitat enhancement, land restoration and conservation education,” according to Wildlife Habitat Council president Robert Johnson. “Koch and its subsidiaries maintain Council-certified programs at 10 facilities throughout the United States,” including Montana’s 300,000-acre Matador Cattle Company Beaverhead Ranch. Flint Hills Resources (a Koch company) helps Ducks Unlimited maintain 36,000 acres of waterfowl habitat on 116 Minnesota lakes. Thus, Ducks Unlimited gave the company its Emerald Teal Award. Another point worth making is one from my own life. I have never worked for a poor person. So let us apply this to our Koch example. Koch Industries “employs about 60,000 people in the United States and another 40,000 in 59 other countries.” These are people, real people, providing sustenance to their kids, spouse, community (in being able to donate to causes they support), and the like. In our own and in the other countries Koch Industries hires people… this job may be what is keeping said family from poverty. Politicians often divide Americans between “the rich” and “working people,” implying that the rich don’t work for their money. Complaining about the tax deal, Rep. Jim McDermott (D., Wash.) contemptuously referred to the rich as “trust-funders,” suggesting that most had done nothing to earn their wealth. But in reality, roughly 80 percent of millionaires in America are the first generation of their family to be rich. They didn’t inherit their wealth; they earned it. The rich are not sitting by the pool, sipping their cocktails; they are sitting in their offices, working their behinds off…. According to Thomas J. Stanley’s book, “The Millionaire Next Door: The Surprising Secrets of America’s Wealthy,” only 20% of millionaires inherited their riches. The other 80% are what you’d call nouveau riche: first generation millionaires who earned their cash on their own. Many millionaires simply worked, saved and lived within their means to generate their wealth – think accountants and managers: regular people going to work every day. Most millionaires didn’t get their riches overnight when a rich relative died – they worked for the money. It certainly doesn’t hurt to be gainfully employed, but half of all millionaires are self-employed or own a business. It does help to have a college degree, as about 80% are college graduates, though only 18% have master’s degrees. Those millionaires are all retired, with nothing else to do but hang around the golf course, right? Wrong: only 20% of millionaires are retirees, with a full 80% still going to work. It’s not as glamorous or fun, but millionaires go to work just like you do; it’s how the money gets in the bank. We’ve already established that most millionaires earned their money not inherited it, still go to work, drive a Ford and worry about their kids’ college expenses. Sounds a lot like the rest of America, right? Millionaires come in all shapes and sizes – some may be elitists, but most are just regular Joes who successfully managed their money. Maybe you see a pattern here: today’s millionaires are people who live within their means, budget and spend wisely, and focus on financial independence first. These are habits that take discipline, but ones we can all adopt to begin growing wealth…. …The Left also makes two other contradictory claims about the rich and their wealth. On the one hand, we are told that the rich spend their money frivolously. Perhaps some do, but this ignores the fact that frivolous expenditures often provide jobs and income for the rest of us. Back in 1990, for example, Congress decided to impose a “luxury tax” on such frivolous items as high-priced automobiles, aircraft, jewelry, furs, and yachts. The tax “worked” in a sense. The rich bought fewer luxury goods — and thousands of Americans who worked in the jewelry, aircraft, and boating industries lost their jobs. According to a study done for the Joint Economic Committee, the tax destroyed 7,600 jobs in the yacht-building industry alone. On the other hand, we are told that lower taxes on the wealthy won’t help the economy because the rich don’t spend enough of their money. That old-fashioned Keynesian economics — which assumes economic growth is driven by consumer demand — ignores the fact that money not spent by the rich is not simply stuffed under millionaires’ mattresses. The savings of the rich provides the investment capital that funds new ventures, creates new jobs, and spurs innovation. The money that the rich save and invest is the money that companies use to start or expand businesses, buy machinery and other physical capital, or hire workers. No doubt there are dishonest or unscrupulous businessmen who have gotten rich by taking advantage of others. And it’s hard to feel much sympathy for the Paris Hiltons of the world, flitting through life with a sense of entitlement that they haven’t earned. But most wealthy Americans have worked hard for what they have, pay more than their fair share of taxes, give generously to charity, and, most important, drive the economic growth that all of us non-rich people rely on. That’s something to remember the next time that politicians start to beat the drums of class warfare. Koch Industries employs about 100,000 globally (60,000 in the US alone). Of Koch Companies’ 60,000 US employees, approximately one-third are unionized. Koch Industries has sponsored the Special Olympics in Wichita, Kansas for the past 33 years. David Koch’s charitable foundation also provided $100 million to New York Presbyterian Hospital to build a new ambulatory care center, as well as $28 million to research causes. Yet another major Koch grant contributed $100 million to research cancer at MIT. Flint Hill Industries (a Koch company) earned a Clean Air Award from the Environmental Protection Agency. This entry was posted in Business, Conservative Republicanism, Mantras & Myths, Socio-Economic, Stats/Polls and tagged Econ 101, Koch brothers, Liberal Mantra, Rich Get Richer.